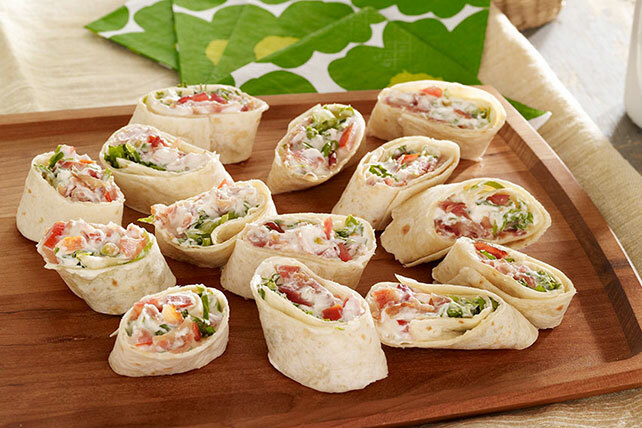 Roll up the flavors of one of your favorite sandwiches into delicious BLT Rollers! You'll get all the elements of the classic in this tortilla version. Even better, these BLT Rollers are ready in just 15 minutes. Mix cream cheese and mayo in medium bowl until blended. Add bacon and tomatoes; mix well. Cut each roll-up diagonally into 7 slices. Pack this BLT roller for lunch along with some crunchy, fresh vegetables. Then round out the meal by adding a serving of your favorite fresh fruit. Save 60 calories and 7g fat per serving by preparing with PHILADELPHIA Neufchatel Cheese, KRAFT Light Mayo Reduced Fat Mayonnaise and OSCAR MAYER Turkey Bacon.